Ruthiebear (Titusville, NJ, United States) on 17 January 2016 in Art & Design. This was hanging from the ceiling in an air bnb we stayed at in Roanoke. The place was owned by two artists. The photo came out so so. But I liked the idea of it hanging, so I used Topaz Texture to spice it up. Bel hommage à notre grande dame. Woooooo. . . Excellent, c'est splendide. joli rendu ! j'aime beaucoup ! Quelle belle douceur, superbe!!! Bise et bon dimanche tout doux! Yes, it has the Ruthie touch.... loaded with energy and flair.... I love your creativity! A fine picture of the unusual decoration hanging from the ceiling. Nice shot. 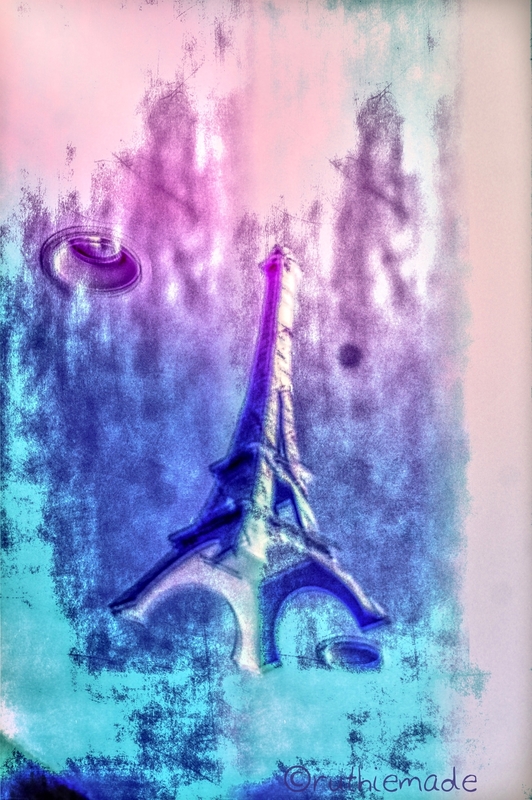 Très beau tableau de la tour quel effet et couleur merveilleux. Very nice .The sister of the Eiffel Tower. Nice Topaz work and result here. I've never seen the Eiffel Tower in quite this way before. Very creative image. A levitating Eiffel Tower! You are a magician. Very creative and attractive textures and colors! It is a lovely piece of art! I really like the colors! Wonderful treatment! Lots of imagination in this art. Linda vista, con esencia de una pintura. Bellos tonos y luz. ***** Saludos.